Edited to Add - Hero Arts no longer sell digital stamps so this stamp is no longer available. I've been playing with some new Hero Arts digikits, and creating some super simple Christmas cards. These cards would be great for mass production as they are so easy to produce. On this first one, I used the Xmas Swirls digikit and a sentiment from Merry Christmas Tree. I added lots of shiny silver gemstones... they make perfect baubles. 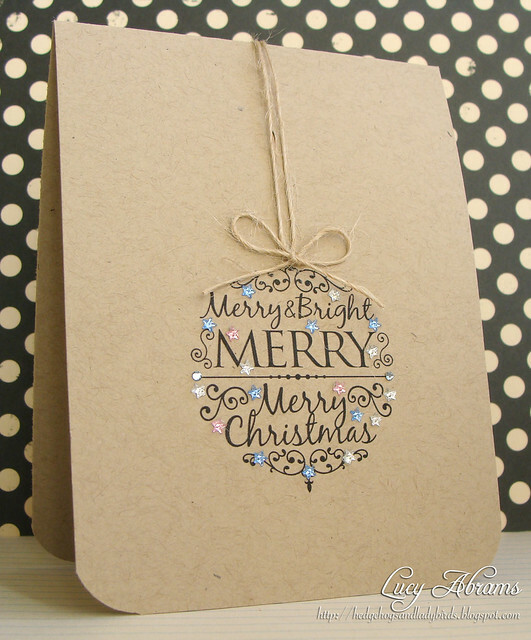 And this card used the Merry and Bright Flourish Tag digikit. So simple, just printed onto kraft and embellished. These cards are an absolute WOW Lucy!! Wow! These are SO gorgeous!!! Both cards are gorgeous. I like the little stars on the second card. Just beautiful, Lucy! Simple but stunning! Love these! Lucy you are the queen of digital, I just love how you turn these images into simply beautiful, elegant masterpieces, you have certainly WOWED! me once again, thank you for inspiring me. love what you can do with digi stamps Lucy.... so amazing. Lucy, these are FABULOUS! Totally LOVE that tree! Simply stunning - I just LOVE that swirly tree thanks for the inspiration! PS Where do you buy your kraft paper from? Super gorgeous! Love the dynamic colors of the black, kraft, and silver! Great touches of the little gems on your second card! So simple and stunning! Love both! 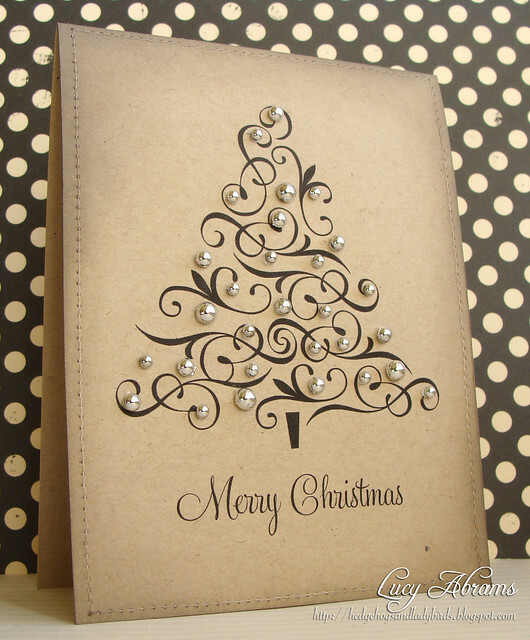 Lucy...love both cards...but WOW...love the first one...the swirls on the tree and the gems...STUNNER! Love your embellishing! I may not always have time to post a comment, but please know I love, love, LOVE visiting your blog. You have sooo much talent!! pure elegance. gorgeous cards, Lucy! LOOOOOOVE them! So elegant. Love the added gems! Your cards are so nice ! These took by breath away! Simply stunning! Only you could pull off perfect Christmas cheer with kraft paper and oh so beautifully. Love love love both your cards--that swirly tree is over the top lovely! This is fabulous Lucy! I love digi and am so pleased to see Hero Arts doing it! Oh my word! Where did you get those cute little stars??? They are perfect for the Christmas season! Beautiful cards too! Thanks for sharing. Amazing cards! The first one really hooked me - that tree is divine - but the little stars on the second just made me grin! 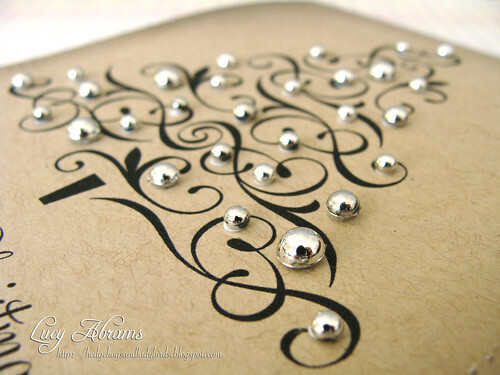 OMG I looooove this simple, yet very stylish card. And you MUST let me know where to get these little silver dots. Soooo adorable ;o) Off to check out the rest of your blog! Greetings, Christa from The Netherlands! Oh my.... these cards are truly beautiful! These cards are beautiful! I just love them. Very nice work you make. I've just come across this beautiful card (at the top of this post) of yours via Pinterest... It really is stunning and I'd like to try something like this. However, after downloading the Christmas Tree flourish... 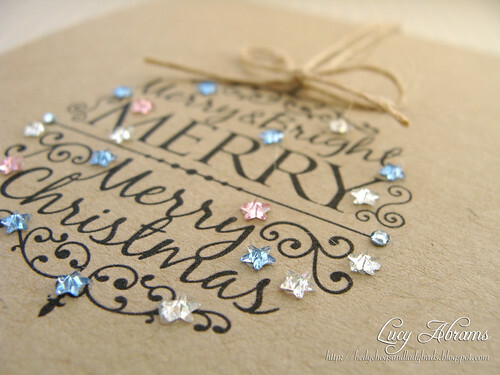 I cannot find the Merry Christmas sentiment at Two Peas... Do you know if it's still available digitally? Hi. Like many above stumbled across your pinterest of a superb card, however, when I click on the link of items you've used on these cards it just says source unknown. Could you point me in the right direction to get these images please. Welcome Baby... and a challenge.